PC World - How could iPhone MMS AT&T's Network? TUAW - What exact processor is insider the new iPod Touch? CNN / Fortune - Is the iPhone really the Paris Hilton of Mobile Phones? 9 to 5 Mac - iPod Touch with camera delayed? When Apple made podcasting available on iTunes v4.9 back in the summer of 2005, Derek from Skepticality, myself and a few others tried to figure out Apple’s algorithm for ranking podcasts. Thanks to an early bug in iTunes where you could unsubscribe and re-subscribe it allowed us to pick a few obscure podcasts and drive them up in the rankings and then see how long it took for them to drop and at what rate. 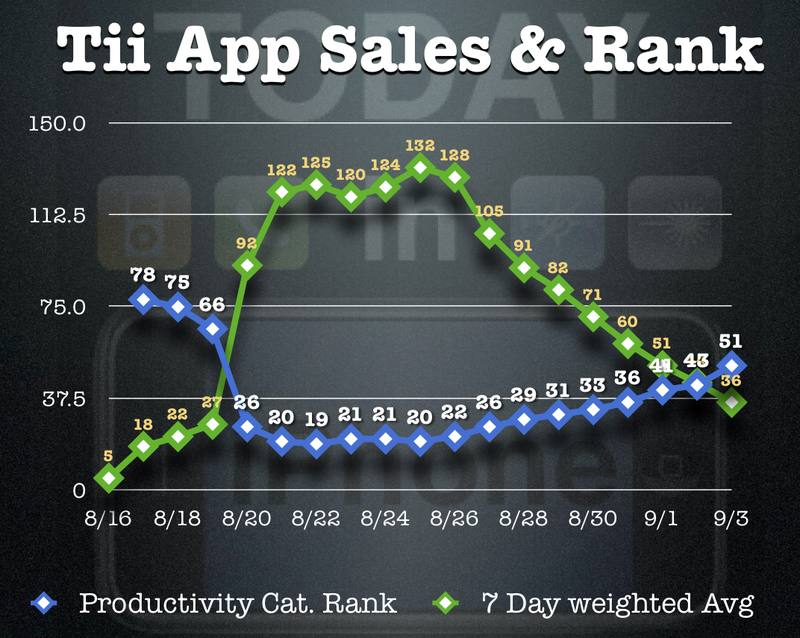 We were able to figure out that it was a seven day average with some weighted average put up front. 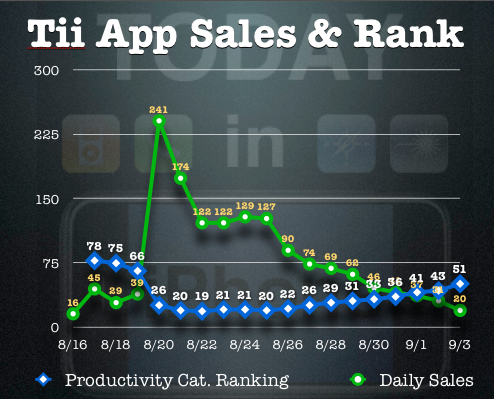 When Apple added Apps to iTunes and had a top 100 ranking I figured they probably were using the same or similar algorithm for rankings. But to test my theory I needed an app in the app store and last month I was able to get the App for the Today in iPhone Podcast approved and in the App store. 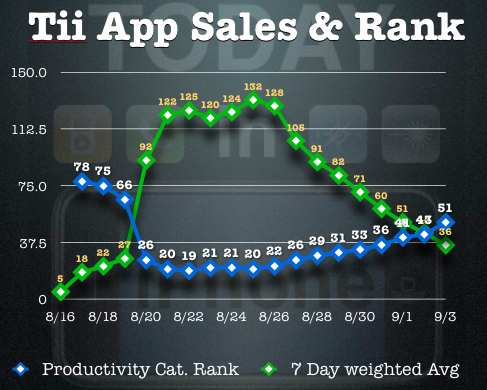 The following is a graph charting the daily sales of the App vs the Peak ranking during that day in the Paid Productivity category. With D1 being the number of sales in the past 24 hours, D2 being the number of sales from 25 to 48 hours ago and so on. As you can see it does match up pretty well. So why do all this? Well one thing I am a geek and I love doing things like this. 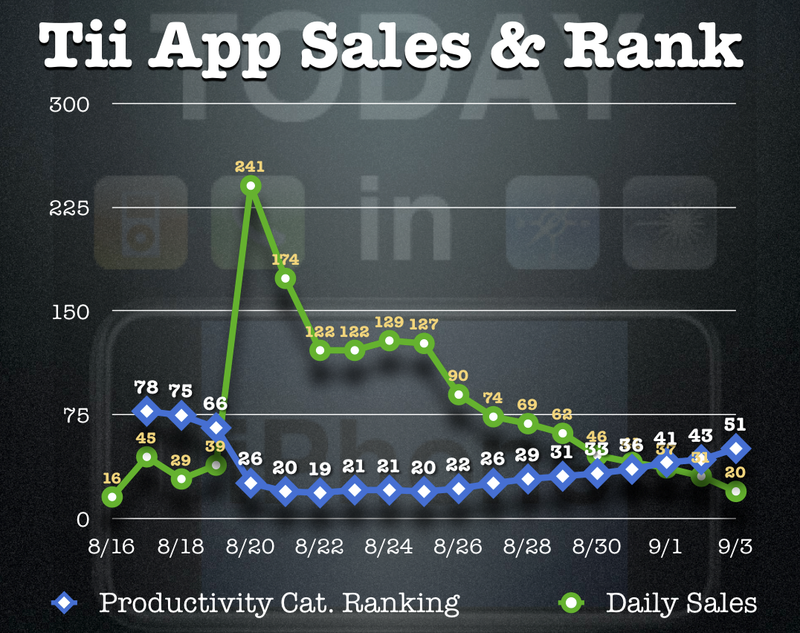 But more importantly it tells you the importance of when you plan a PR / Marketing blitz for your app that you need to focus it almost all in a week’s period of time. Don’t plan on doing one thing this weekend and another the weekend after and a third the weekend after that. Yes on going PR / Marketing is important as well, but you really need to do the majority of your PR / Marketing blitz in the first few days after you say go. That is when you will get your best results for your efforts. Don’t get me wrong I am not saying don’t bother doing PR and marketing after the first week - just that if you have a few “big things” planned make sure they happen at the same time. Questions / Comments are welcome below - Spam is not.